You don't need to buy loads of equipment for painting a room. I rarely use more than two brush sizes and two roller sizes. I use a 1" brush for very fiddly areas, windows etc. 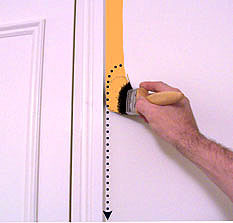 and a 2" brush for larger areas like doors or "cutting" between walls and ceilings or door frames. The key is to buy decent quality brushes. This is important and will make the job much easier and professional looking. Avoid short stubby narrow brushes. Brushes with long thick bristles load with paint much better and allow you to paint nice clean edges when cuttung in, and also give a much better finish on woodwork like doors etc. And remember, a good quality brush will last for years if you look after it. "Cutting in" refers to painting all the fiddly bits between walls and ceilings or between walls and woodwork. With a little practice you'll get a professional look especially if you use a good brush. I find some people are tempted to use a much smaller brush for cutting in but if you practice you'll find you actually have much better control with a larger brush and end up with much better results. For cutting in I use a two inch brush. 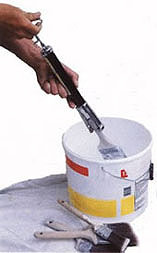 To load the brush dip it halfway into the paint and rub off some of the excess. Hold the brush sideways and use slow smooth strokes shown by the dotted line of around12-18". When painting doors try to load the paint evenly in sections over the surface. I like to apply the paint with a small sponge roller to get an even finish. Whilst the paint is still wet I use a 2 inch brush to gently go over the surface to brush out the roller marks. Carefully brush vertically from the top to the middle and from the bottom to the middle to end up with a professional looking finish. I you're painting panelled doors start with the panels and finish with the outer sections. You may get the odd paint run at the bottom of the panels. Check them after a few minutes or so before the paint dries and get rid of them with your paint brush. You don't have to spend a lot of money on rollers to get good results. You can get a perfectly good roller and tray for £3-4. I use a 9 "medium pile roller for walls and ceilings and a medium pile mini roller doors and for behind radiators . This gives a fairly smooth finish with a hint of texture. When painting with a roller you'll need a paint tray. Gently load the roller and roll it on the tray to get a nice even load. Don't be afraid to get plenty of paint on the roller. I try to paint in roughly 1 metre square sections with a fully loaded roller. Roll it on the wall and go over that area a couple of times to get an even finish. But don't try and spread the paint too thin or you'll end up having to do more coats than you need. The number of coats depends how dirty the walls are and how dark the original wall colour is. Tip I always use a roller with a pole. Not just for reaching to ceilings but all the walls. I find it so much easier on the arm and it gives a nice even pressure. You can paint a whole room with very little effort. Try it you'll really notice the difference! Wipe as much paint from the brushes as you can. Similarly scrape down the roller with a blunt edge. For water base paints brushes/rollers can then be washed in water. Oil based paints need to be cleaned with white spirit. Put some spirit in a suitable container and swish the brush round until the paint has loosened. You may leave it to soak if you want. Then dry of with an old cloth. As an alternative you can buy special brush/roller cleaners which are simple devices which spin the paint out. If you haven't cleaned your brushes properly and they've gone hard try soaking them in brush restorer. If your roller has gone hard simply replace it. NB. You shouldn't pour the paint or white spirit down the sink as it gets into the water system. With used spirit let it settle for a few days and it will clear with the paint residue settling at the bottom of the container. Simply decant the perfectly good spirit from the top to re-use, and let the residue dry out before disposing of it. You local council will be able to advise you on how to get rid of unwanted used paint.